The French built the Maginot Line of forts and fortifications after World War I. It was supposed to keep the Germans out of France. It didn’t. The Germans quickly went around it and took France again in WW II. A Maginot Line is now a metaphor for a defensive barrier that gives a false sense of security. The Morganza Spillway is supposed to keep the Mississippi River out of Baton Rouge. The US Army Corps of Engineers built it after the epic flood of 1927. It is part of the Mississippi River and Tributaries Project (MR&TP) that’s supposed to protect against another epic flood. But the MR&TP hasn’t been tested by an epic flood. It could be a Maginot Line. The MR&TP has some weak spots. One is the Morganza Spillway. Not only that, the river (like the Germans) is doing the unexpected. It’s steadily rising and flooding more often, longer, and higher — despite and partly because of the MR&TP. It may not take an epic rain to produce a Project Flood (MR&TP worst case scenario). The Morganza is just upriver from Baton Rouge, and the Old River Control Complex (ORCC) is upriver from the Morganza. Both can divert flow from the Mississippi River down the Atchafalaya basin to the Gulf at Morgan City to reduce flooding at Baton Rouge and then New Orleans. That is, they can if they work like they are supposed to. But the Morganza Spillway doesn’t work like it’s supposed to. The Morganza Spillway sits in the levee along the Mississippi River two miles away. It’s in a field that the LaCour family has owned and farmed for over 100 years. In the 1940’s the Corps made the family an offer it couldn’t refuse: 43 cents an acre for flowage rights over the field. The Corps now sends floods over the field through the spillway onto other fields and woods down some 900,000 acres of floodways to make its way (slowly so wildlife can be evacuated or escape) to the Gulf below Morgan City. The Morganza was built in 1954. 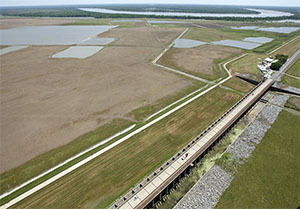 It is 4,159 feet long, and has 125 bays to release flow down the floodway. It has been opened twice: once in 1973 when 42 bays discharged 194,000 cubic feet per second. And again in 2011 when 17 bays briefly discharged 182,000 cfs, and then only 120,000 cfs (20% of design capacity) due to safety concerns. Most bays have never opened. So it has never really been tested. The Morganza is supposed to discharge 600,000 cfs to protect Baton Rouge from a Project Flood. But can it? It can’t be tested to see. It’s too disruptive. Its discharge erodes fields and roads, threatens wildlife, farming, oil and gas operations, recreational facilities, and Morgan City and other communities. Just talking about opening it causes a public outcry. Actually opening it is a politician’s nightmare. In 2011 the National Guard cleared the floodway (also subject to flood easements) so the spillway could open. In the 2016 flood the Corps commander agonized over to open or not to open and ultimately didn’t. So the Morganza wasn’t a factor in 2016 and wasn’t much of one in 2011. But the ORCC was a big factor. It probably saved Baton Rouge in 2011 and held the river’s crest to nine feet above flood stage. It diverted over five times the flow of the Morganza and could have diverted more. It could have diverted more flow in the 2016 flood too when the river crested eight feet above flood stage. If it had, the crest would have been 8.3 feet lower according to a Corps model. And this year’s May 2017 crest would have been seven feet lower. So why isn’t ORCC used to relieve floods? It can divert over 1,000,000 cfs from the Mississippi through four different structures. (The MR&TP limits this to 620,000 cfs.) It discharges down the Atchafalaya River which falls steeply and swiftly straight to the Gulf through designated floodways. The ORCC operates every day. But never at or near capacity — because the Corps doesn’t operate it for flood control. It operates it to maintain a 70-30 split of the combined flows of the Mississippi and the Atchafalaya (which includes the Red River) to the Gulf. This restricts the Mississippi’s diversion to about 23% of its flow except in rare instances like the 2011 flood when the Red River had little flow. (The other 77% slowly discharges at New Orleans.) Why 70-30? Because that’s what it was in 1950. The Atchafalaya River is Mother Nature’s natural relief route for Mississippi River floods. It’s the shortest, steepest, and fastest way to the Gulf. The ORCC is the control valve to the Atchafalaya River. The Corps won’t open it. Don’t be surprised if Mother Nature goes around it. The Corps could operate ORCC for flood control and change its discharge as the Mississippi River changes. This dynamic operation would relieve major floods, reduce batture flooding, and facilitate navigation on the Mississippi. The Corps (and Congress) could make the ORCC a better relief valve by increasing the discharge to the Gulf at Morgan City and Wax Lake and raising levees there. But even without these changes, it can discharge much more flow than the Morganza in an epic flood. It doesn’t require any changes for the ORCC to relieve this current 2017 flood which will crest six feet above flood stage at Baton Rouge and 7.5 feet above at Natchez. This is the most fact driven article I have seen on this issue. Excellent. Who can we contact to see some changes?